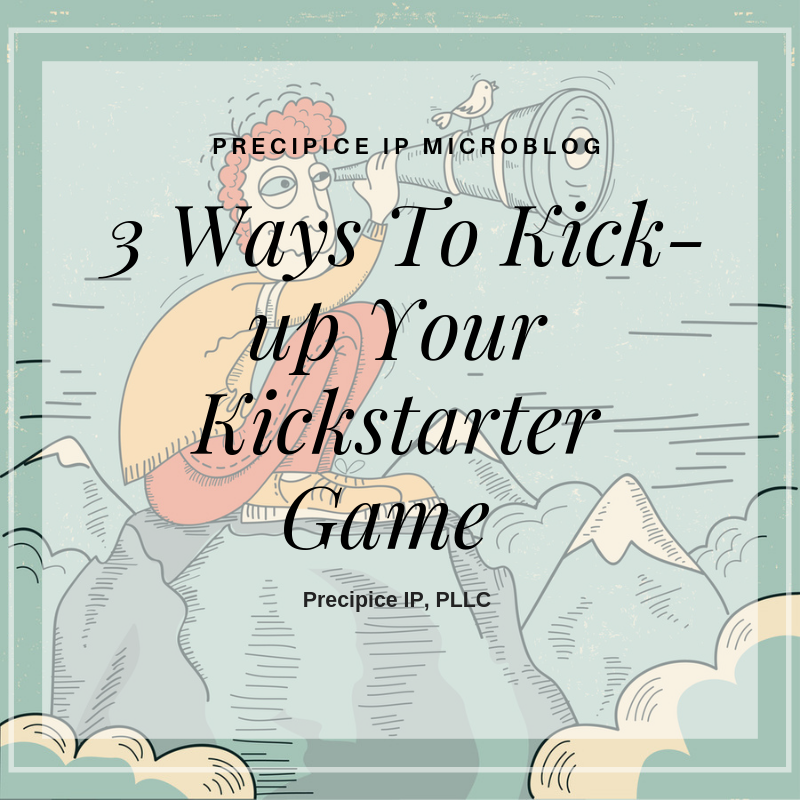 3 Ways To Kick-up ðŸ‘£ Your Kickstarter Game — Precipice IP | Technology Law. Launching science and technology products on Kickstarter, or any crowdfunding platform can be intense. Iâ€™ve seen a few of my clients launch successfully, but I can tell you from first hand experience, it took a lot of planning, community-building, and strategizing around the productâ€™s intellectual property. If youâ€™re thinking of launching on Kickstarter or any crowdfunding platform remember to consider these three things. Do not under estimate the time involved in launching a successful campaign. There are people out there with tremendous skill and expertise in understanding and executing on what it takes to plan a successful launch. Donâ€™t understate how important it will be to communicate, and perhaps, over communicate with your backers every step along the way. Understanding the funding goals, timing, and communications flow should not be under appreciated. If I had to pick one critical element in a successful Kickstarter launch, its the need build a community before launching the campaign. I canâ€™t emphasize enough how important it is to build interest and excitement before the campaign is underway. This may mean building your email list 3 to 6 months ahead of the campaign, but from what Iâ€™ve experienced this critical detail can mean the difference between a successful launch and one that results in a colossal waste of time and money (by the way, Iâ€™ve seen grown men cry). If youâ€™re not a marketing expert, consider working with a marketing company that can help you build your community. Having a strong community before launch can ultimately determine your success or failure. A good Kickstarter strategy must include protecting the productâ€™s intellectual property. You should consider whether the product has novel functional features that could benefit from a provisional patent filing. You should also think about whether the product has novel design features that could benefit from a design patent filing. And by all means, donâ€™t forget to consider protecting the productâ€™s brand through trademark filings. The most valuable asset an emerging science and technology startup has is itâ€™s intellectual property- so donâ€™t give it away. No product launch effort is guaranteed. When it comes to Kickstarter and other crowdfunding platforms, there are a few best practices out there, and from what I see, these practices work. Following them (or not) could mean the difference between your success or your failure.